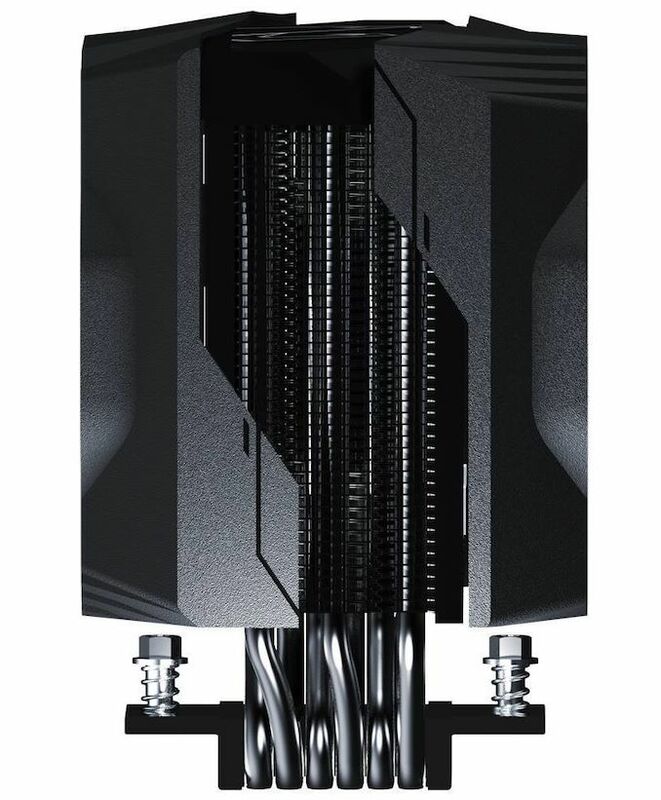 The ATC800 has six direct contact 6mm nickel plated copper heatpipes that reach into aluminum fins which are cooled by two fans in a push-pull arrangement. 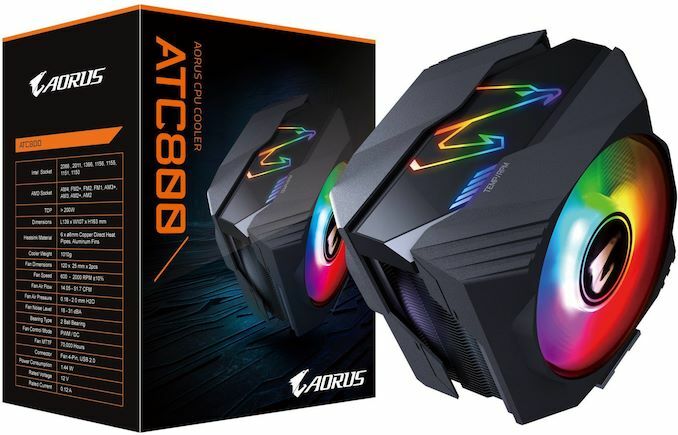 A plastic shroud covers the fans and the top of the cooler, with the top of the cooler adorned with an Aorus logo in RGB as well as a temperature/RPM meter (which isn’t the same thing, but for some reason it is here). 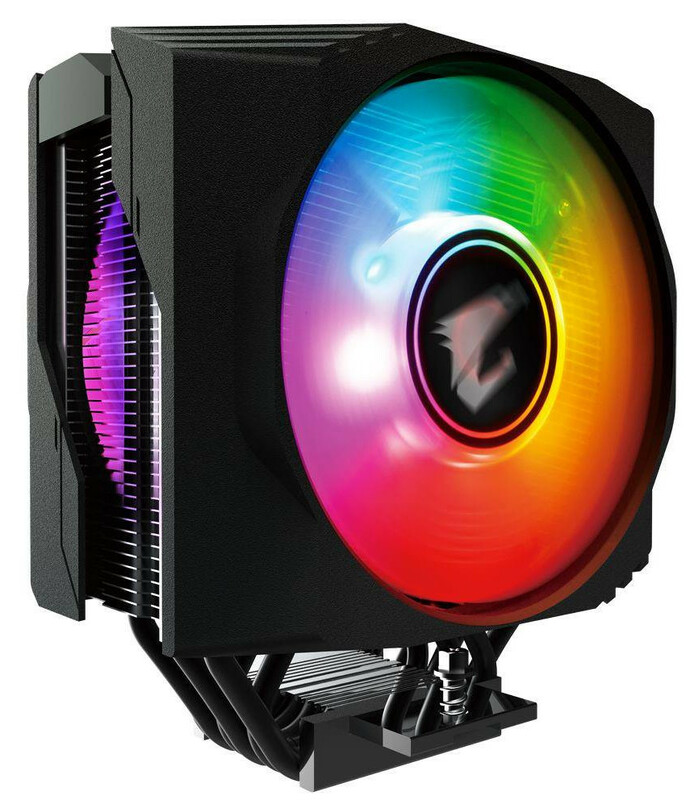 Both fans are also full RGB, and expected to synchronize with GIGABYTE motherboard software. Socket compatibility includes 115x, 1366, 2011, 2066, AM4, FM2+, and AM3, and all similar sockets therein. The obvious socket left out there is TR4, because of its different requirements. The full weight of the cooler is just over 1 kg (2.2 lbs), with the fan air flow rated from 14.05 to 51.70 CFM at 0.18 to 2.00 mm H2O pressure for a 18-31 dBA fan noise level. The fans can be controlled by PWM or DC, with 4-pin headers for the fans and a USB 2.0 connection for the LED control. Total power consumption of the cooler is rated at 1.44W. GIGABYTE recommends memory modules a maximum of 43mm when used with the cooler. 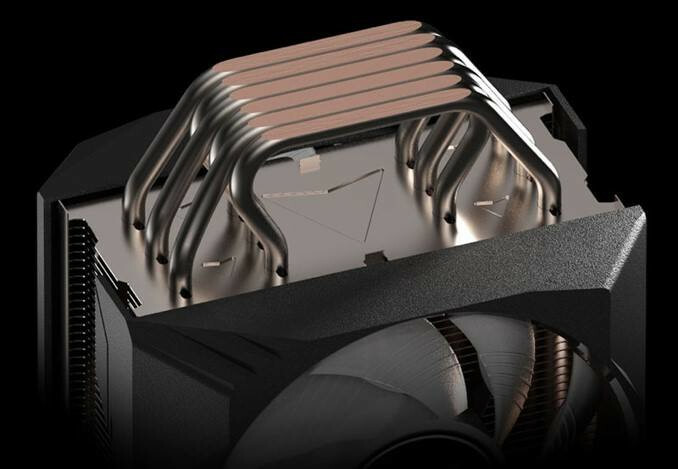 GIGABYTE rates the cooler at 200W TDP, which satisfies all the systems for which it is capable, including the Core i9-9900K, however there might be some thermal limits when overclocked. Pricing was not revealed – we might expect to see more information between now and Computex. The product is expected to be available later this month or early May in North America. Looks like a decent cooler. A bit to bling bling for my tastes but that's just me. I know having the heat pipes exposed can be a good thing but I have also always thought when the surface is not completely flat as in having those grooves beside each heat pipe is asking the thermal paste to do extra work trying to close the air gaps from those grooves along the bottom of the heat sink.